If you're a fan of bagels and lox topped with red onion and capers for savory breakfast, you're going to go completely cray cray over the idea that you can now get those same flavors in a pasta salad. Kind of like breakfast for dinner, right? And who doesn't love that? 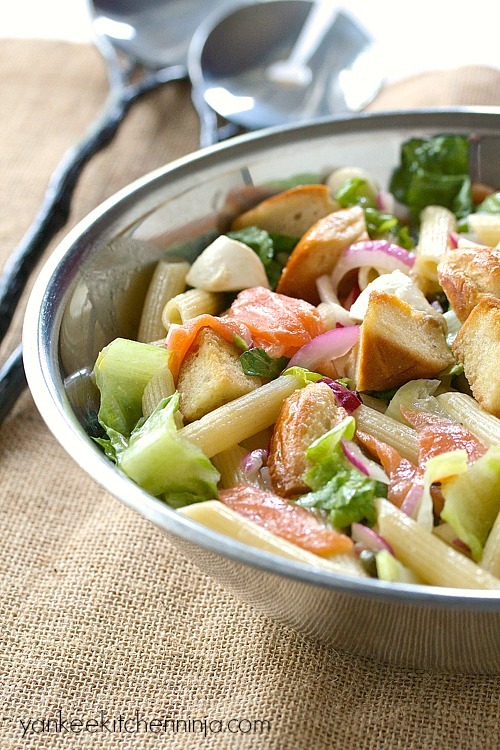 And, hold the phone, I haven't even told you the best part yet: this bagels and lox pasta salad only gets better as it sits around, which makes it the perfect dish to bring to a potluck or a BBQ. No plans to travel or not a sharer? Good, because that means you're going to have the best brown bag lunch leftovers ever. 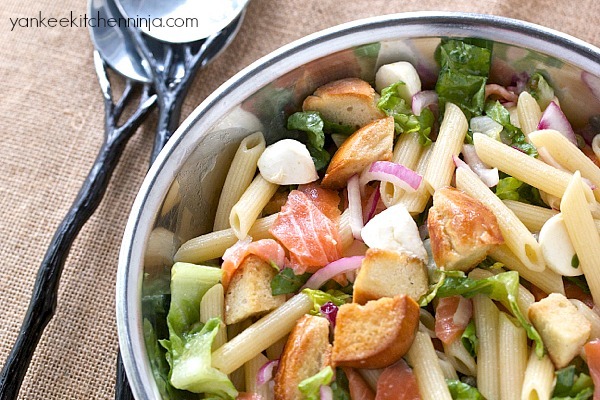 Have I convinced you to turn breakfast into dinner with this bagels and lox pasta salad? Leave a comment: The Ninj wants to know. Preheat oven to 400 degrees F. In a bowl, toss the bagel bites with a drizzle of olive oil and spread on a baking sheet. Bake for 8-10 minutes or until lightly toasted. While the bagel is toasting, cook pasta according to package directions, adding the green beans in the last few minutes of cooking. Drain and rinse with cold water to remove most of the heat. In a large bowl, whisk together the vinegar, oil and mustard, then stir in the onion and capers. Add the pasta and beans, bagel, lettuce, mozzerella and salmon, tossing gently to coat. Season to taste with salt and pepper. Totally loving the addition of toasted bagels to this salad, so much better than croutons! Mmmmmm! LOX - I now want some for lunch! It makes a super lunch, GiGi! 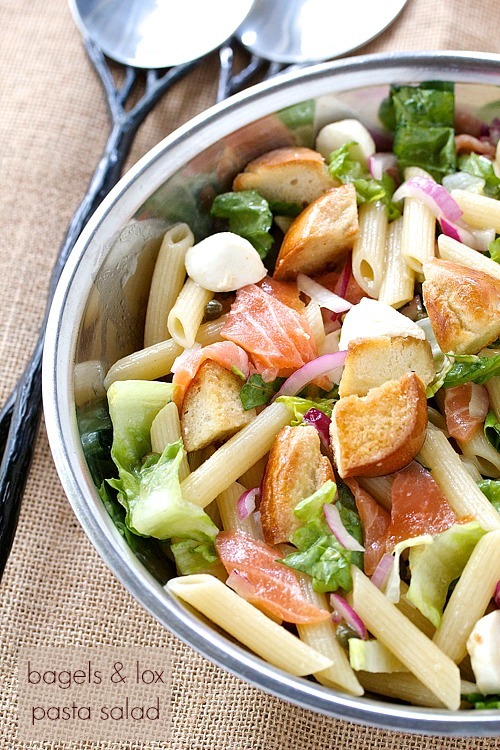 Bagels and lox pasta salad, GENIUS! Great creative recipe, Jules! Sorry, a bit too far for delivery. :-) But I hope you give it a try, Allie!